The Oklahoma City Thunder kicked off preseason basketball last night falling to the Detroit Pistons 97-91 at Chesapeake Energy Arena. The Thunder were shorthanded with Russell Westbrook and Abdel Nader out for minor injuries and Paul George for “personal reasons”, but the Thunder bench had the opportunity to prove themselves out there and get back into the swing of things. `Dennis Schroder and Steven Adams are GOOD. This duo fascinated me last night. The fluidity and chemistry they had on the court was like they had been playing together for years. Dennis credited training camp for this chemistry, and the fact it only took a week for them to develop this kind of pace is really remarkable and will work to the Thunder’s advantage moving forward. Dennis Schroder in general is GOOD. 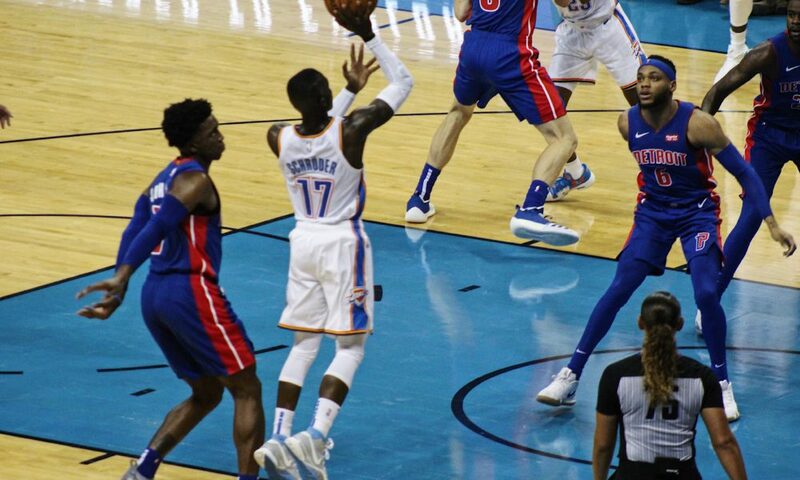 I shrugged off the excitement of acquiring Dennis Schroder at first, but last night completely changed my perspective on his ability and he brings to the table for the Thunder offense. He will be a really good fill in for Russell Westbrook when needed, and the fact that I feel so confident in Russ, Dennis AND Raymond is comforting. Steven Adams is still strong as bricks, but he looked a little slow on the offensive rebound. Andre Drummond definitely out-rebounded Adams last night, and Steven looked a little slow getting around, but his strength is still unmatchable. Watching him get to the basket with the kind of force he possesses is incredible. He’s able to plow over other bigs on the floor to get his shot in, and he took a lot of dunk and hook shots last night showing he still has that comfort and ability to finish. Tim Luwawu-Cabarrot needs to clean it up. It’s his first game in the Thunder uniform against guys other than his own teammates, so he needs the benefit of the doubt, but there seemed to be too many missed opportunities for TLC. Lots of times the ball slipped through his fingers, couldn’t follow through at the basket, and I would love to see him become more offensively dominant down low. Patrick Patterson is an excellent starter. I love the way Patterson plays. He’s become ten times stronger, in my opinion, than he was last season. Patterson credits actually being able to participate in training camp this year for his strength and more powerful playing style. He takes those long shots beyond the arc, has good accuracy, and he can also finish under the basket. If I had any say in it, Patterson looks like a starter to me. The Thunder will be in Minnesota tomorrow for game two of preseason basketball taking on the Timberwolves at 7:00 p.m. The Thunder will cater to the Tulsa crowd on Sunday taking on the Atlanta Hawks in the BOK Center at 2:00 p.m.
Watch below for a postgame wrap-up, full postgame interviews from Billy Donovan, Raymond Felton, Alex Abrines and Dennis Schroder. Also we have a full pregame presser from Pistons Head Coach Dwane Casey.